Plan your own golf trips to Ireland and Scotland and save! Clear, concise golf travel guides. Where to play, where to stay, & how to plan a great golf trip itinerary that works. Download free golf course and driving-time maps for Scotland and Ireland. Compliments of Golf Adventure Guides. Enjoy! Clear and concise expert advice. No ads. Imagine playing golf on the most amazing golf courses in the world. Didn’t think it was affordable because of the high price of booking a trip with a tour operator? Think again! You can plan and book it yourself—I will show you how. 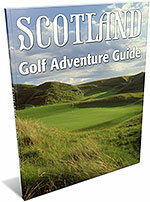 Plan your next Ireland or Scotland golf trip using my clear and concise guides. You’ll get expert advice on which courses to play, where to stay, driving times, and how to put together a good itinerary. No ads. Seriously high value add. 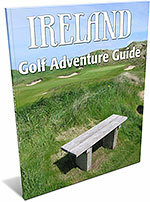 If you’ve ever wanted to play golf in Ireland or Scotland you will find the Ireland & Scotland Golf Adventure Guides to be an essential resource and its value priceless! No Ads. I don’t accept placement fees or advertisements from the establishments listed in my guides. Golf courses, hotels, airlines, car rental firms, and tour operators cant buy their way in. I provide an unbiased, independent view of the travel-planning experience and my only objective is to make it easier and more enjoyable for you. You get concise information on the top 56 golf courses in Ireland, the top 59 courses in Scotland, and great accommodations for both in multiple price ranges. The maps and driving times enable you to craft itineraries with confidence and put you in control of your vacation. Active web links in the PDF download version of the guides make online research fast and easy. Just think of all the time and money you’ll save! Plus, the guides contain only the critical information you really need to plan your trip, not a lot of extra fluff to pump up the page count. And did I mention, no ads?! Satisfaction Guarantee. I want these guides to delight you. If you are not satisfied for any reason, please let me know and I’ll make it right. What are you waiting for? Don’t let life pass you by...start planning that trip of a lifetime now! PS — If you have any questions, give me a call.